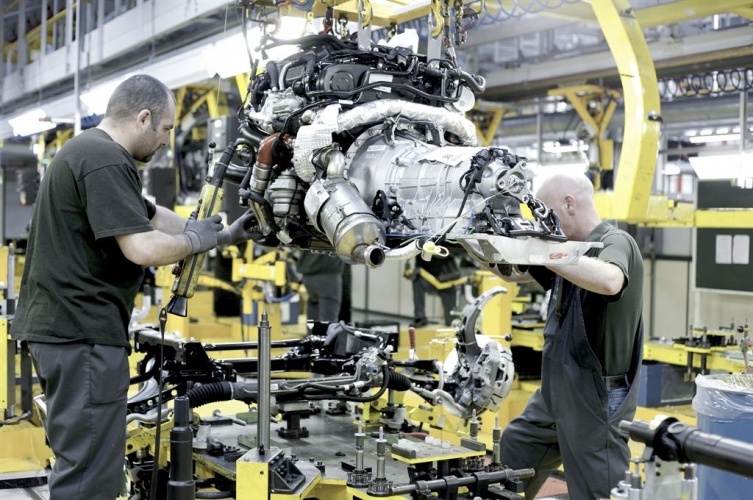 According to new figures released today by the Society of Motor Manufacturers and Traders (SMMT) turnover for the UK automotive sector hit an all time high of £69.5 billion in 2014. Manufacturing output, vehicle sales, jobs and export values also grew, while the environmental impact from vehicle production has been reduced dramatically. Inside JLR’s Castle Bromwich Plant. The firm’s success has been at the heart of the sector’s growth. The latest figures confirm an upward trend for new vehicle demand and manufacturing output, with almost 1.6 million vehicles built in 2014. Last year, car production alone grew to 1.53 million units – the highest level since 2007 – with an increasing number of vehicles built for the domestic new car market, which itself grew 9.3% to reach 2.48 million registrations last year. On current trends, UK car output is expected to reach an all-time record level of 1.95 million vehicles in the next two years. Large investments are still being committed to new and expanded production facilities in the UK, resulting in significant sector-wide recruitment, with an additional 27,000 jobs created in 2014 – a 3.5% increase on the previous year. The number of people employed in automotive (including manufacturing and retail) now stands at 799,000, with the average worker responsible for generating £440,000 in turnover for the sector. Investment in skills has also been crucial with employee training up by more than a third (35.2%) and some 500 new apprentices and trainees taken on by the sector last year. International demand for British-made vehicles also continues to increase with total export value rising 1.8% to £34.6 billion – a staggering 103.8% uplift since 2000. It adds up to a considerable increase in the industry’s direct contribution to the British economy, rising 6.2% to £15.5 billion last year. encouraging trends…But how to ‘we’ compare with the real ‘power-houses’ of automotive production? Those two nations, who for so many years after 1945 were NOT permitted to make any weapons, nor their means of delivery: so set too and made everything else? That is the real ‘test’: well isn’t it? Got to love your complete disregard of history, Mike B. The Defence Industry survived because it didn’t overpay for uncompetitive perfromance, while most UK manufacturing had to be nationalised to protect its employees from economic reality and disappeared down a plughole of uncompetitiveness entirely of its own making. I have posted so often on this topic and related topics: if Cynical old Engineer would like to review such I am sure a simple search in ‘The Engineer’ will provide what he might need to advance his view?of mine? The concept of a ‘cost-plus’ contract [ie suppliers work out how much it costs to make something, add on some factor for overheads and then another for profit: and send the bill to HMG…who pay up without question…is hardly the basis for the discipline of ‘market-forces’ : forces which, unless I am mistaken are (according to all those who have actually insulated themselves and what they do completely from such) what drive us all to be more efficient. If our editor and your-good-self would prefer this exchange to be conducted privately (mikeblamey@yahoo.co.uk) I would be delighted.